The quality of the story depends on the quality of listening. And listening is inviting and holding space for the story to emerge. A story wants to be invited with a gentle and honest invitation. This invitation is a question - a question like a door through which the storyteller is entering his or her own story. And depending on the question the path of the story leads to different places - the way we ask questions shapes the story that is to be told. What if we would put more emphasis on the questions we asked? In Rhea Wessel´s workshop about constructive journalism we listened to stories of turning points in our life. The death of a beloved one, a painful illness, or a traumatizing moment – difficult stories that we live through; painful to remember and hard to talk about. “What gave you confidence during these times? What is the most valuable gift that you got out of the situation?” With these questions we invited different layers to the story and looked for moments of personal growth and new findings about own purpose. And we heard moving stories – stories about moments of vulnerability and loss that opened space for discovering own braveness and reconnecting to own strengths and about heroes and angels that accompanied us through tough times. But it is not only about the invitation. Once invited the story needs space – to grow and unfold, to dive deep and reach high. This space is created by the listening. Listening like little grandchildren waiting for granny´s good-night-story to be told – with wide open eyes, and ears, and hearts. Not to lose any word that is being said and ready to experience the story with their whole beings. No distraction, no side-thoughts. This kind of listening which goes far beyond content is creating and holding space in our busy world for the story that wants to emerge. Without mastering listening on that level, we will not hear the great stories that are waiting to be told. 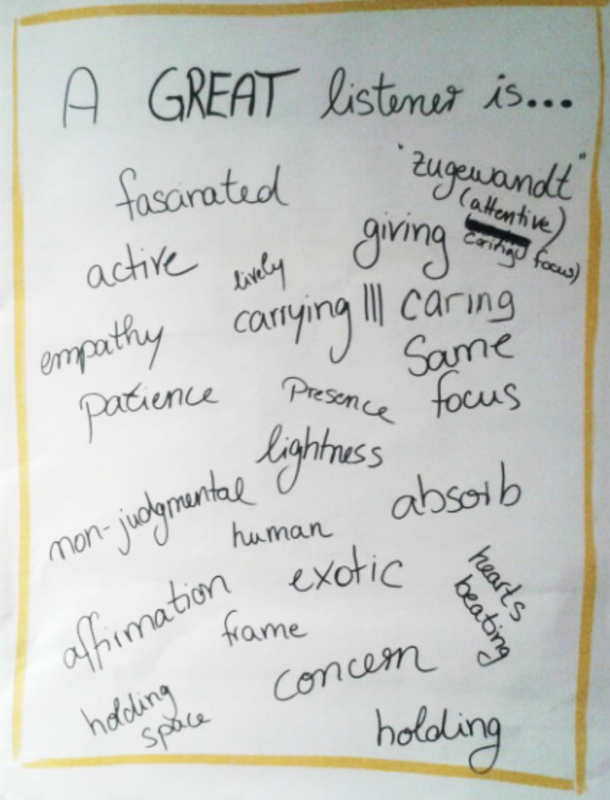 In Jodie Goulden and Raquel Ark´s workshop about listening we collected these attributes of a great listener. And then if we would really listen with all our attention, all our curiosity and all our empathy – creating and holding that space for the new that is wanting to be heard. I´m sure we would feel a glimpse of it, of these other future possibilities that want to be invited and be given some space. How can we use our human capacity of collective sense making to master today´s challenges together? What are we learning in these times of disruptive change about our very own inner longing and how do we integrate it in the solutions we create? What kind of stories do we invite to emerge? Do we ask for the most aufmerksamkeitsergende facts? The quality of the story depends on the quality of listening. A question that shapes the door through which the storyteller is entering his or her story. And a story needs space – to grow, to unfold and to dive deep.